← Musou☆Stars? Another Warriors Game? Another day, another mahjong game. 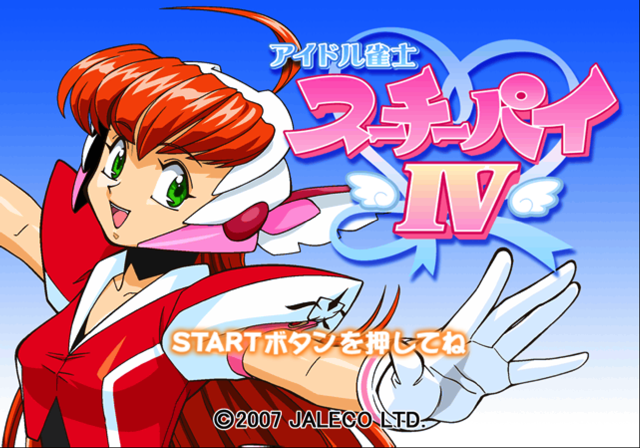 This time, Idol Janshi Suchie-Pai IV – the last entry in the series and not a bad way to wrap things up. So, while Japanese knowledge isn’t essential, the game is a lot funnier with at least a basic understanding. As usual, the plot is just there to move things along. 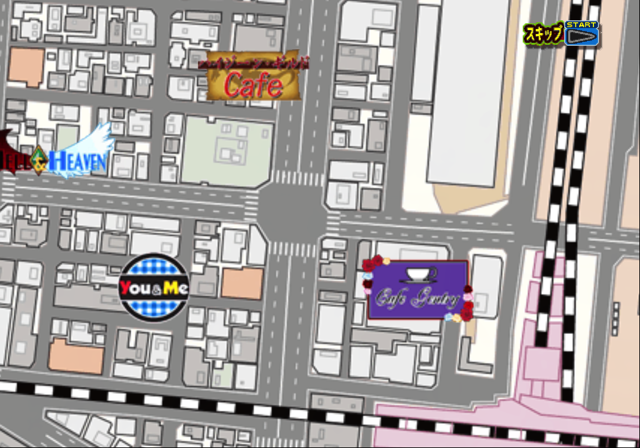 The You & Me game center, a setting in the first games in the series, has closed down and been replaced with Maid Cafe You & Me, with the player as the manager of the cafe and tasked with running around Akihabara to poach maids from OTHER establishments. That’s a bit of an in-joke in itself, considering when this came out and how arcades were on the downturn but you couldn’t throw a rock in Akiba without it bouncing off a frilled skirt. Naturally you do this by challenging them to mahjong, although at least one of the maids you run into is just tired of her current job and comes back to You & Me without a fight. Matches are broken up with little skits, though of course you can just skip them if you don’t follow the language. They’re very energetic, with lots of animation and vocal emotion, and I kind of want to make avatar images out of the little talking heads. 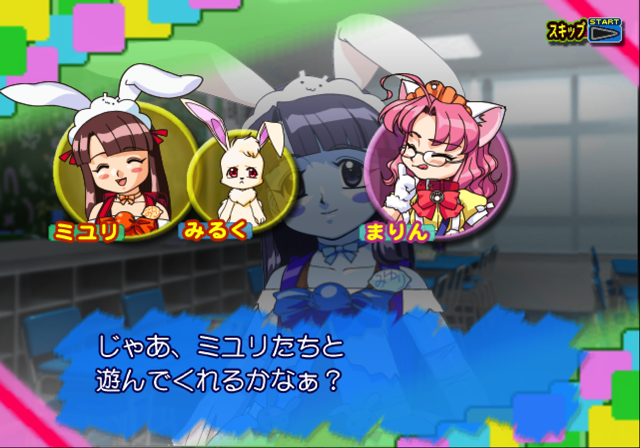 The last boss is the series mascot, Miyuri. 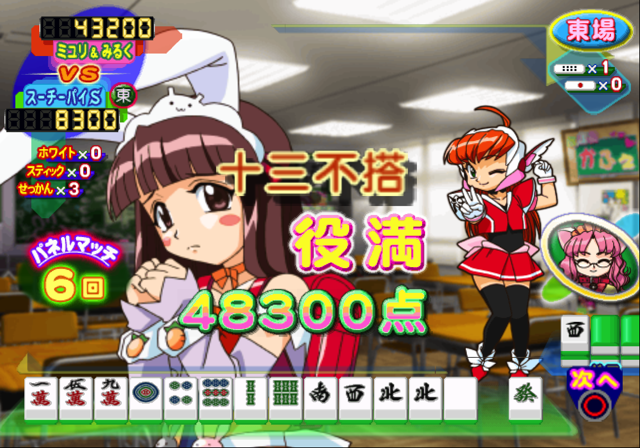 I’m not sure if this is actually the first time you play mahjong against her – in previous entries, she’s just been someone you bump into and who tells you where to find your next opponent or so on. She DEFINITELY wasn’t an opponent in any of the games where clothes actually go flying, for obvious reasons. I had to look this up, because wut. I had a bit of a hard time laying my hands on a copy of Suchie-Pai IV in Japan, and it took several trips to random Book-Offs and Mandarakes before I found a copy, but it was worth the hunt. 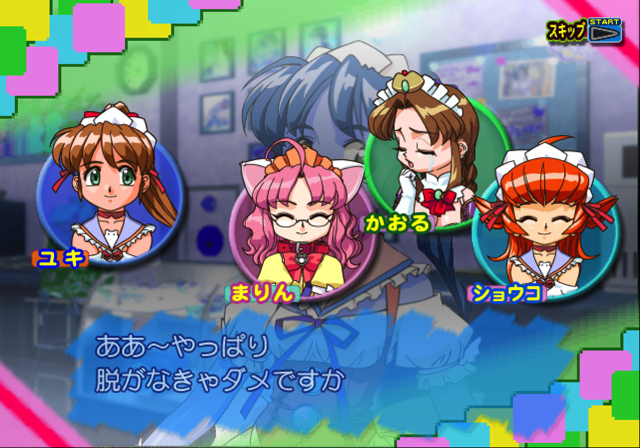 After playing several Saturn mahjong games, the change to PS2-era resolution and animation quality was a heck of a jump, and it was good times spending a few hours with the familiar characters. Even if Miyuri IS evil. This entry was posted in mahjong, PS2, videogames. Bookmark the permalink.